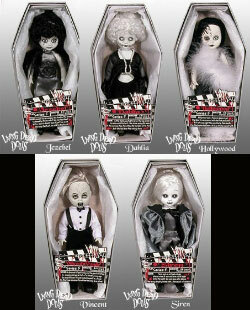 Living Dead Dolls: Series 5 Black & White Club Mez Exclusive Chase setIncludes: Jezebel, Dahlia, Hollywood, Vincent Vaude, and SirenThese come with a clear lid rather than the black lid on the Mystery Dolls so you can see doll without opening coffin LIMITED TO ONLY 600 SETS! 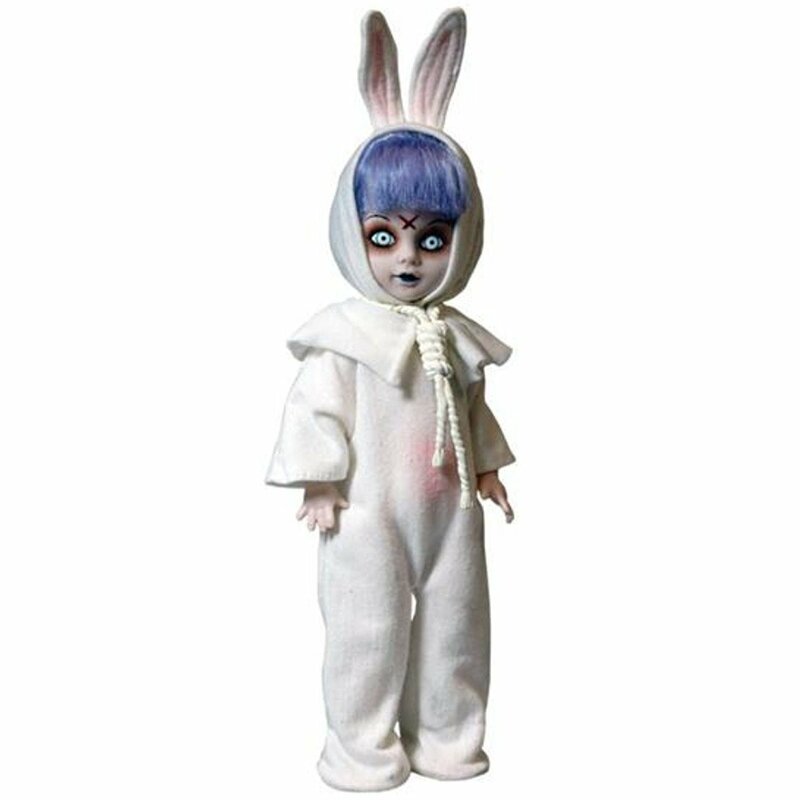 Living Dead Dolls: San Diego Comic Con Blue Eggzorcist - Mint condition shrinkwrap still protecting doll although cut along lid to determine if blood-splattered which it's notRegular version - not pictured A drawstring used to fasten ears of a rabbit, Put this little bunny in a kiddie casket. 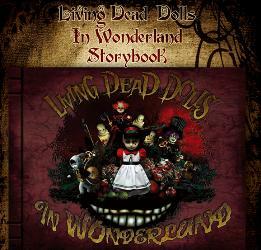 Living Dead Dolls in Wonderland Book 1st EditionTravel with the Living Dead Dolls, down the rabbit hole into Wonderland, with first ever The Living Dead Dolls book! This limited edition book re-imagines Alice's adventures in Wonderland with vivid full color digital illustrations and features some of your favorite Living Dead Dolls. Hardcover design with over twenty mesmerizing pages. First printing of 1500 books. Mezco unveils it's best Halloween treat ever: Three retro Halloween-themed boxsets that include an old school-styled plastic mask, exclusive 10" doll and a coordinating T-shirt (XL only). This set consists of Gabriella. Each set harkens back to your favorite childhood Halloween memories with an adult-sized plastic mask with elastic straps, cut-out eyes and mouth hole; a limited edition exclusive Living Dead Doll with glow-in-the dark mask that coordinates with the set; one exclusively designed extra large tee shirt by Dave Cook and packaged in a fantastic retro-style Halloween costume window box. Limited to 500 pieces of each set, worldwide. These are sure to go fast and become a super-rare prized addition to any collection. 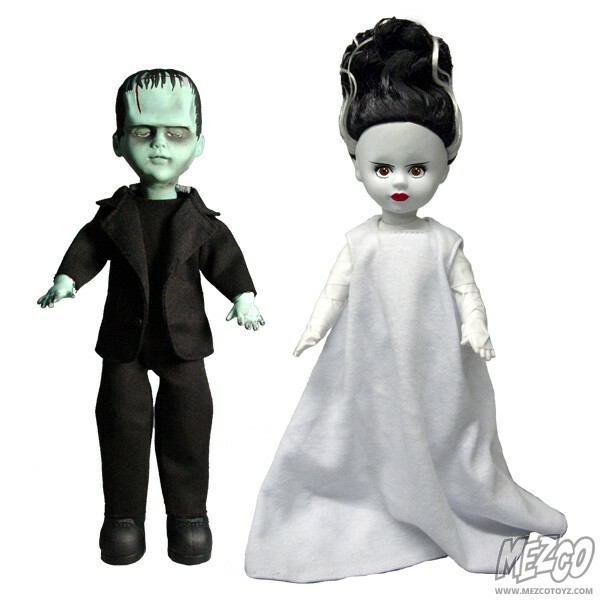 Living Dead Dolls Presents Universal Monsters: Frankenstein and his Bride You’re invited to the wedding of the century: Frankenstein and his Bride! 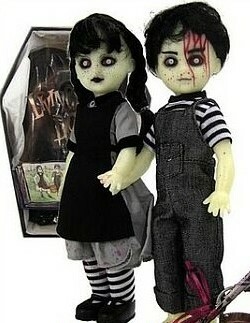 The Living Dead Dolls present the couple that was truly made for each other (from exhumed corpses of course). 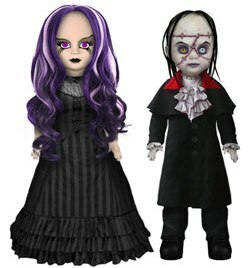 Since their introduction, Frankenstein and his Bride have become one of the most popular couples in the history of the silver screen, now they become the latest additions to the Living Dead Dolls family. 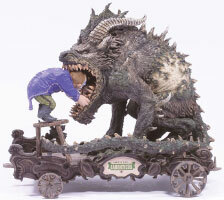 Each 10 inch figure has 5 points of articulation, wears real cloth clothing, and comes individually packaged in a collector friendly window box. Mezco Toyz Living Dead Dolls (Thirteenth) 13th Anniversary Damien Under the full thunder moon, Mezco breaks open the crypt and releases Living Dead Dolls Thirteenth Anniversary Series. 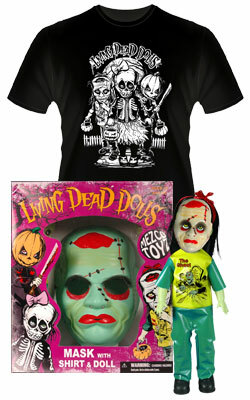 This special series pays tribute to the very first set of Living Dead Dolls which first thrilled collectors 13 years ago. This is the first time in Living Dead Doll history that a complete series has been updated and reissued. 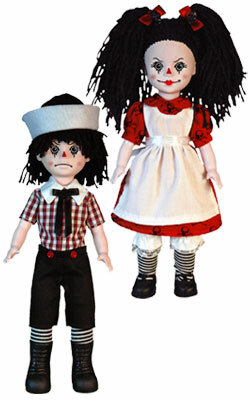 All the dolls will come individually packaged in special 13th anniversary coffins, each with their own death certificate. Mezco Toyz Living Dead Dolls (Thirteenth) 13th Anniversary Eggzorcist Under the full thunder moon, Mezco breaks open the crypt and releases Living Dead Dolls Thirteenth Anniversary Series. 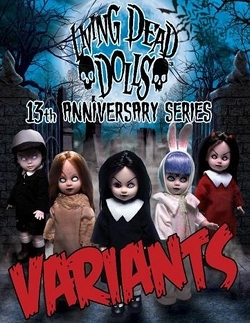 This special series pays tribute to the very first set of Living Dead Dolls which first thrilled collectors 13 years ago. This is the first time in Living Dead Doll history that a complete series has been updated and reissued. 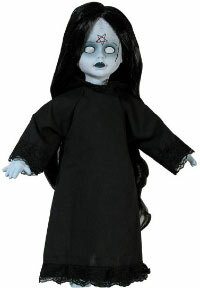 All the dolls will come individually packaged in special 13th anniversary coffins, each with their own death certificate. Mezco Toyz Living Dead Dolls (Thirteenth) 13th Anniversary Posey Under the full thunder moon, Mezco breaks open the crypt and releases Living Dead Dolls Thirteenth Anniversary Series. 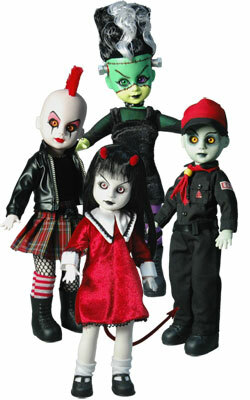 This special series pays tribute to the very first set of Living Dead Dolls which first thrilled collectors 13 years ago. 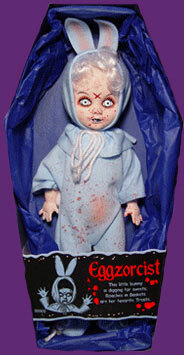 This is the first time in Living Dead Doll history that a complete series has been updated and reissued. 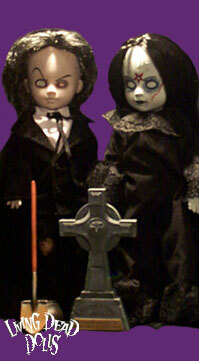 All the dolls will come individually packaged in special 13th anniversary coffins, each with their own death certificate. Mezco Toyz Living Dead Dolls (Thirteenth) 13th Anniversary Sadie Under the full thunder moon, Mezco breaks open the crypt and releases Living Dead Dolls Thirteenth Anniversary Series. 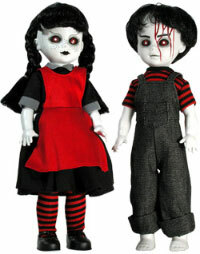 This special series pays tribute to the very first set of Living Dead Dolls which first thrilled collectors 13 years ago. This is the first time in Living Dead Doll history that a complete series has been updated and reissued. 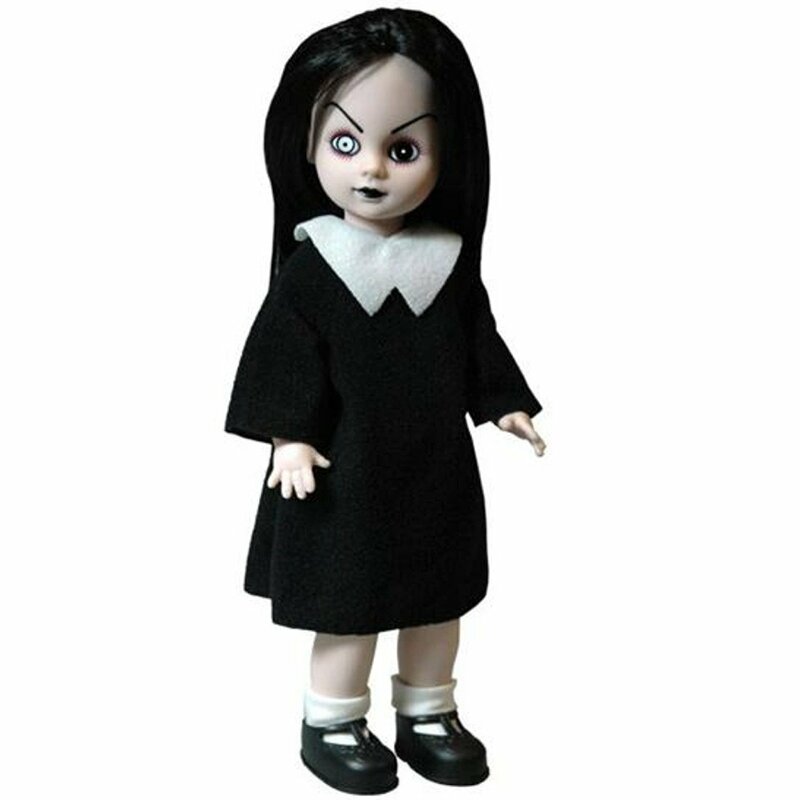 All the dolls will come individually packaged in special 13th anniversary coffins, each with their own death certificate. Living Dead Dolls Presents Freddy Krueger: A Nightmare on Elm Street 2010 The infamous maniac from the NEW 2010 A Nightmare On Elm Street returns. Dressed in his trademark striped sweater, the terror of Elm Street comes with a removable hat and his newly redesigned lethal glove. Freddy Krueger comes packaged in a collector friendly fifth panel window box. Living Dead Dolls Presents Scary Tales: Hansel & Gretel In search of the witch Hansel and Gretel do go, The ghoulish siblings plan to eat every bit of her from head to toe, The witch will try to run, yet her old bones are too slow, But the twins are determined to find her, as their hunger does grow. 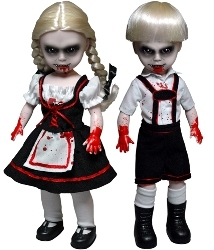 Both Hansel and Gretel are individually packaged each in their own individual coffin. Dracula; one of the first Universal Monsters, and hands down the most famous vampire of all time. 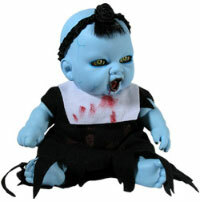 The king of the vampires is the latest addition to the Living Dead Dolls line. From his widow’s peak to the hem of his cape, every detail of Dracula has been captured. 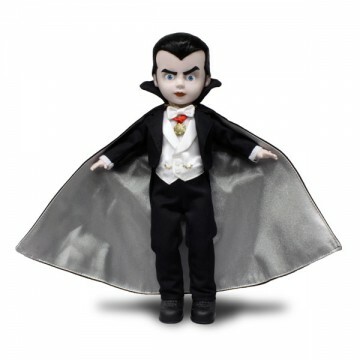 The Count wears one of the most regal outfits ever produced for a Living Dead Doll; he comes complete with full evening dress, his trademark cape, his famous medallion, his red Carnelian stone ring, and even his watch chain, have been carefully recreated. Special attention has been paid to his hypnotic eyes; they seem to stare into your very soul as one eyebrow arches upwards, beckoning you to your doom. 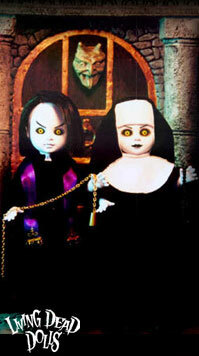 Living Dead Dolls Count Dracula comes complete in a collector friendly window box featuring art from the famous film. "Congratulations, you are still alive?" The Saw Puppet, mechanical messenger of the jigsaw killer from the Saw movie franchise, is a contemporary horror icon, he is also the newest addition to the Living Dead Dolls Presents series.Countless victims have awoken to this harbinger of doom! And he explains the perverse rules to a game of life and death that they are being forced to play. Now he can be yours to bring home! 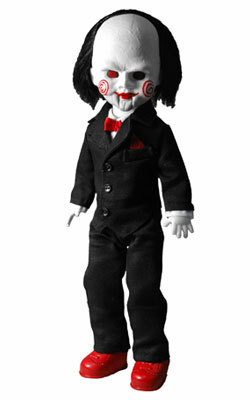 Meticulously crafted with film accurate detail the Saw Puppet stands 10inches tall and comes complete with a removable cloth outfit and rooted hair. Each doll is hand painted and packaged in a fifth panel collector-friendly window box. The LDD resurrection set returns to San Diego with four reimagined dolls: Sin, Ezekiel, Sheena, and Bride of Valentine.Each member of this limited edition quartet of evil features glass eyes, comes with its own death certificate, and entombed in its own coffin. 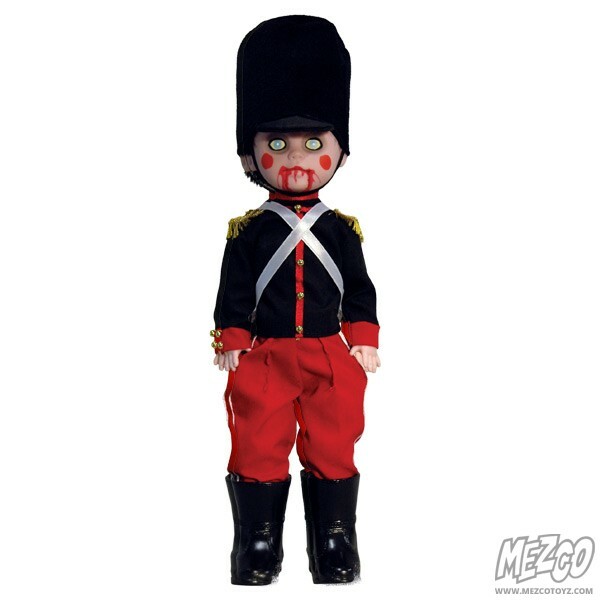 As light fades away and the air grows colder, he silently stands guard, the Living Dead Dolls Toy Soldier. Standing proudly in his dress uniform, the Toy Solder comes complete with a faux bearskin hat and is packaged in a special holiday coffin. 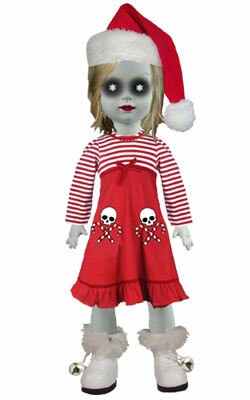 The latest addition to the ever-expanding Living Dead Dolls line is Nohell, dressed for the season in a festive red and white holiday dress with real bells on her boots and removable hat. 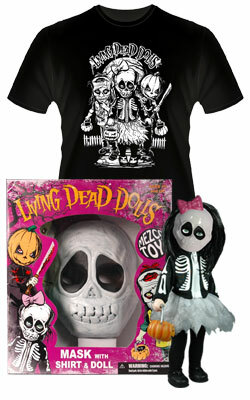 This 10 inch tall Living Dead Doll comes in a specially colored coffin and has a removable holiday hat. 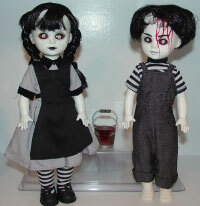 Living Dead Dolls: Mr. Graves & Abigail Crane Club Mez ExclusiveA shovel is used, to fulfill his greed.But when he reaches her grave, it's her time to feed. 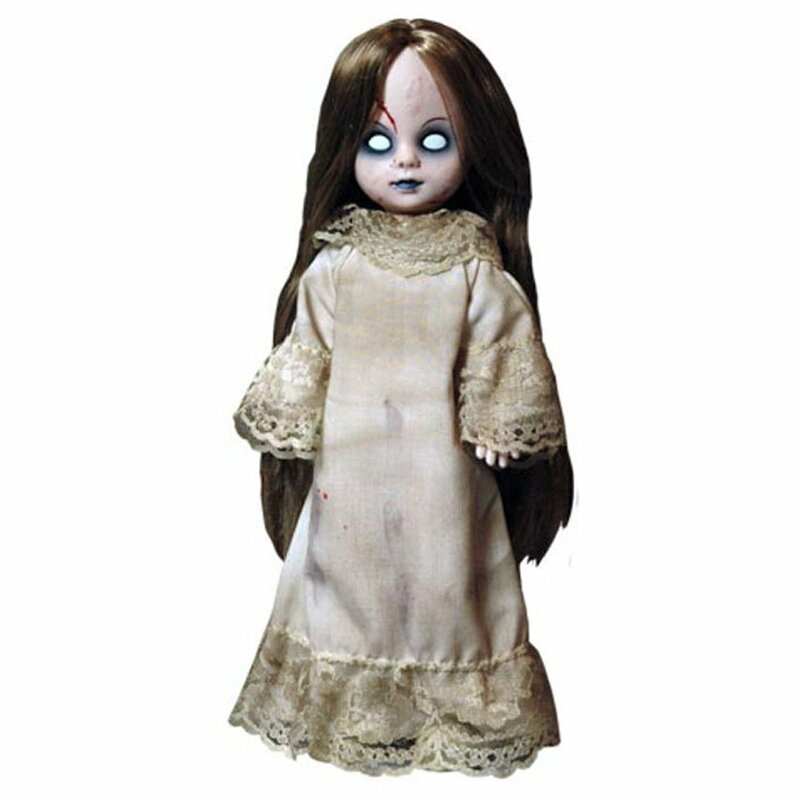 BOX NOT MINT Living Dead Dolls Club Mez Exclusive: 18" Porcelain Abigail EXTREMELY LIMITED TO ONLY 800 PIECES Abigail Crane features a soft body with porcelain head and extremities.Comes packaged in an oversized wood-colored coffin box. The handmade process involved in the production of Abigail gives each doll a unique paint application. Additional "stressed" detail makes these dolls extra creepy with sporatic paint chips (this is not a production error, the chips are intentional). 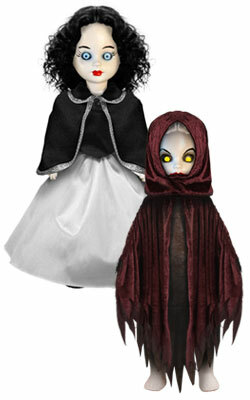 Living Dead Dolls: Sinister Minister & Bad Habit - BLACK Spencers ExclusiveRighteously struck down by lightning,They rose again fast and frightening.This blasphemous boy and demented sister,Have a habit that's bad and a sermon quite sinister. 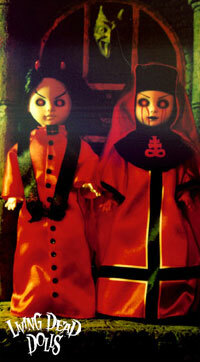 Living Dead Dolls: Sinister Minister & Bad Habit RED Hong Kong ExclusiveRighteously struck down by lightning,They rose again fast and frightening.This blasphemous boy and demented sister,Have a habit that's bad and a sermon quite sinister. 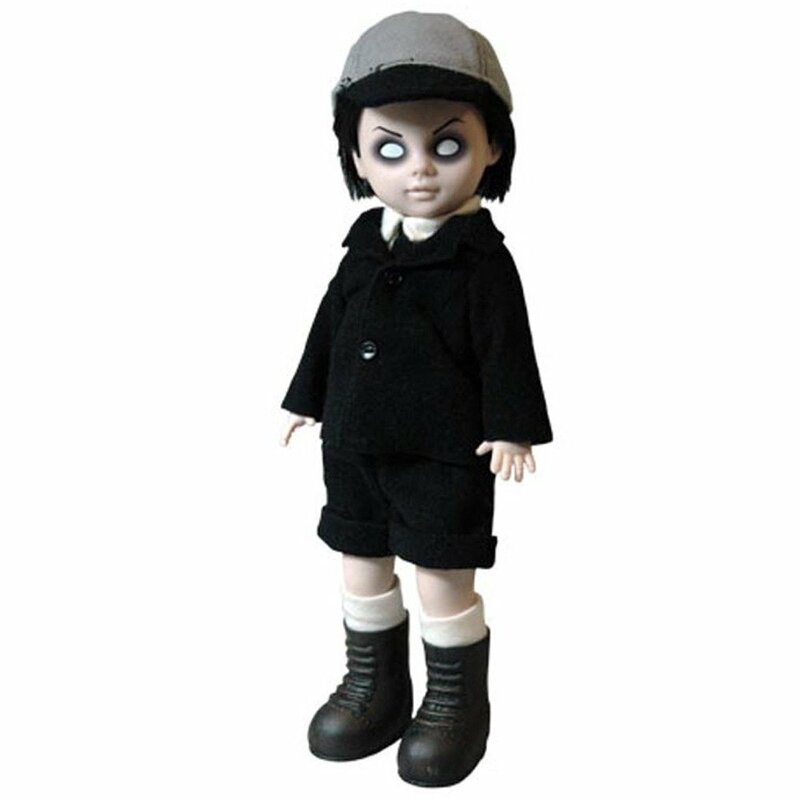 Living Dead Dolls: Sinister Minister & Bad Habit RED Hong Kong ExclusiveRighteously struck down by lightning,They rose again fast and frightening.This blasphemous boy and demented sister,Have a habit that's bad and a sermon quite sinister. NUMBERED SIGNED BY THE CREATORS!!! Mezco unveils it's best Halloween treat ever: Three retro Halloween-themed boxsets that include an old school-styled plastic mask, exclusive 10" doll and a coordinating T-shirt (XL only). This set consists of Calavera. Each set harkens back to your favorite childhood Halloween memories with an adult-sized plastic mask with elastic straps, cut-out eyes and mouth hole; a limited edition exclusive Living Dead Doll with glow-in-the dark mask that coordinates with the set; one exclusively designed extra large tee shirt by Dave Cook and packaged in a fantastic retro-style Halloween costume window box. Limited to 500 pieces of each set, worldwide. These are sure to go fast and become a super-rare prized addition to any collection.